"I've been running throughout my pregnancy and I felt really, really good during the whole process," Montano said after the qualifying heat. That the 28-year-old former University of California star finished last in her heat didn't matter one bit to the crowd gathered at Hornet Stadium. Trailing the lead pack by more than 120 meters for most of the race, Montano received a rousing ovation as she finished her first lap and the cheering grew louder when she finally crossed the finish line. "I just didn't want to get lapped and be the first person to get lapped in the 800," said Montano, the 800 national champions the past four years. She was never close to being lapped, taking a nice relaxed pace from the start and maintaining it throughout. 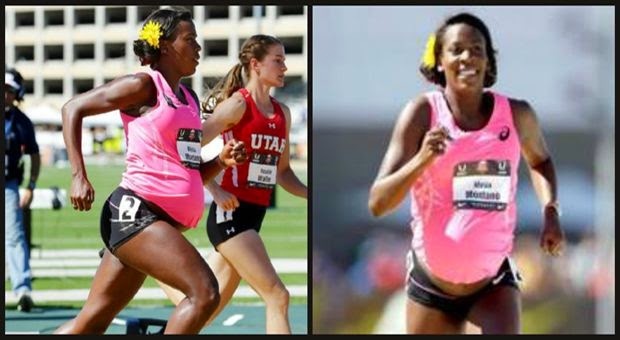 "That took away any fear of what the outside world might think about a woman running during her pregnancy," Montano said. "What I found out mostly was that exercising during pregnancy is actually much better for the mom and the baby. ... I did all the things I normally do ... I just happened to be pregnant. This is my normal this year." Thanks Julie Johnson-will keep on Post.